Hello, fellow readers and bloggers. I know its been a while since I’ve said much about anything. Starting the week after my transplant, my days have run on and on against each other and I don’t even know what day it is quite often. TMI moment coming up: Stop right here if you don’t wanna read about it. My soapbox, remember? Ladies and gentlemen, I have been suffering from various viruses and GVHD. These have all caused and continue to cause severe diarrhea and nausea with vomiting. Which all course has lead to me losing so much weight and three subsequent hospital stays. Sixty-six pounds lost to be exact at this point. I know what you’re thinking, especially you girls! You will not believe how many women have told me how good I look. GOOD?? I usually just nod and change the subject. Listen up ladies, I would much rather have lost weight the right way or be a happy, healthy, chubby bunny. Had I been given the decision to lose the weight via my own will power or because of a horrific disease, I would have definitely picked the first one. So please don’t compliment me on the weight loss. Its not something I’m particularly proud of. My transplant day of November 16, 2012 was my miracle day. God gave me a second chance at life through my own father’s stem cells. Little did I know that that gloriously, happy day would turn into the most nightmarish months of my life. I cannot describe how hard it has been to just get from sunrise through sunset every day. Its a constant struggle between my mind, my emotions, my physical strength, and begging God to end my misery. The reflection in the mirror deceives me with my gaunt face, sunken eyes, pale skin, and newly growing hair that doesn’t know which direction it wants to go. I don’t recognize this girl and she scares me. Cancer and treatment do some pretty horrible things to the body. My skin is forever dry and I feel like I leave a blanket of snow every time I get up. I have bruises all over my arms from having blood drawn every day. I look like I just got initiated into a gang with all these bruises. Food just doesn’t taste the same right now. Things I used to love to eat make me feel nauseated now. There’s not much of a selection for me to eat either that won’t cause said diarrhea or sudden onset of nausea. It sounds like a prison menu. No dairy, no fresh fruits or vegetables, no fried foods, no greasy foods, nothing spicy, no whole grains, and the list goes on. I think prisoners might have it better than me now that i think about it. There’s a constant bad taste in my mouth from all the medication and chemo effects. The steroids have made me lose so much muscle mass, it’s so tiring to do simple things like brushing my teeth or getting my shoes on. Even talking is a challenge. Typing this is making my arms burn and I can barely keep my fingers from shaking enough to do it. Everything leaves me out of breath. Everything. This is why I’ve been away so long. Yes, I’ve screened my phone calls. Yes, I’ve tucked myself away into my own little nook. But I’m not sorry. I need time and time alone to get better and to be alone with God while I try to figure out what it is He wants to show me through all of this suffering. Yes, my life is an open book, but this book is gonna take a little longer to be written. Like the great M.J. said in his song, I need to make a change for once in my life and I’m starting with the girl in the mirror. Where have I been this past month and a half since my last blog entry? Well, I’ve been in my own little world, that’s where I’ve been. I’ve been Bubble Girl. Yeah, I’ve been stuck in the hospital most of the time with my visitors having to wear masks and gloves and cover gowns but that’s not exactly what I mean. The weeks leading up to my transplant, I kept asking my doctor questions if I’d be treated like a ‘bubble girl’ during my stay in the hospital. Little did I know, I would end up turning myself into just that. Everyone could see me but they couldn’t really see me. What truly was a joyous occasion on November 16th took a frightening toll on my physical health and consequently on my spirit and emotions. I stopped writing. I stopped talking. I stopped eating. I spent entire days in bed. I wouldn’t leave my hospital room. I would even say there were days when I didn’t smile. I cried endlessly. I spent many sleepless nights wondering when it would all be over. ‘Probably never’, I would think to myself. I kept everyone at arm’s length, tucking myself away into my own sanitized, little space. I built my own emotional bubble around myself. I was Bubble Girl and I didn’t care. I’m not gonna go into detail of the horror of going through a stem cell transplant just yet. That’s gonna take a few entries and, frankly, I’m not ready to go there. I’m still sitting in the hospital as I write this and I need time to sort it all out for myself before I begin to recount all the sordid details for you. But, believe me. Its gonna be GOOD. This blog entry, in particular, is more for my benefit if I really think about it. It feels good to get some of this off my chest and finally step out of this emotional plastic bubble, good to finally be able to talk to people like a somewhat normal person again. How did I get rid of my bubble? Because since my transplant, I’m finally feeling better again. I’m finally feeling more like myself, like Cristina. I can finally see that light at the end of this still stretching tunnel. I can’t say that Bubble Girl won’t be back, but I can say that she has definitely taken a hike. Its amazing what feeling better physically can do for a person. Its easy for someone looking in from the outside of someone’s bubble to say the typical: “Oh, this is only temporary. You’ll feel better soon.” Or my favorite, “You’ll look back on this one day and won’t even remember how bad it was.” When you’re in that position of constant pain and suffering, there is no end in sight. The struggle itself should never be belittled. And the struggle is something that you never, ever forget no matter how hard you try. The constant lingering, tingling sensation in my fingertips from the latest effects of chemo is just one of the things that doesn’t let me forget. Enough of that for now because its finally time for some good news. Make it GREAT news. 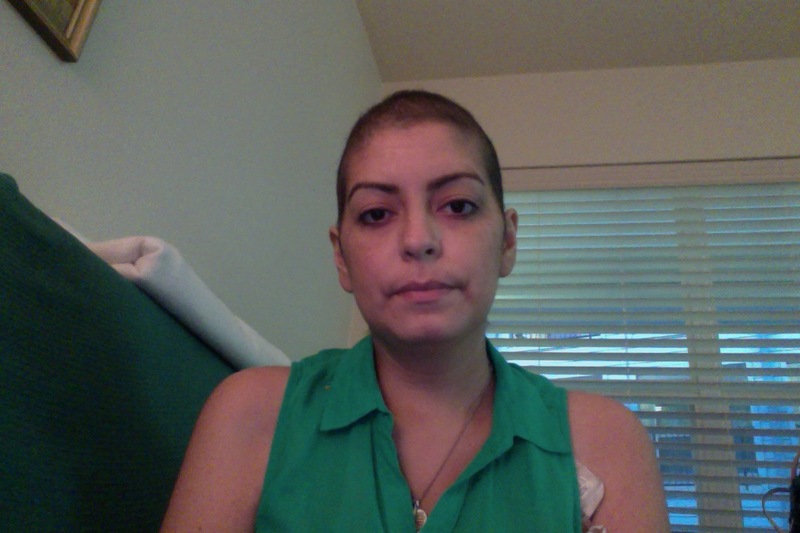 Today marks Day 43 since my stem cell transplant. Its been forty-three days since I was given my second chance and I’m almost at the halfway mark of my stay here in Houston. And, Day 43 now marks the day I first got the best news since my transplant. After my first PET scan, full CT scan, and bone marrow biopsy post-transplant, my attending doctor told me this morning that there is “no sign of disease”! He paused so that I could process the news and I did not cry which is a first for me. I have always gotten emotional when I get any news about my health, be it good or bad, and for me to not have cried is in itself a HUGE victory for me. Instead I smiled a big, toothy smile and he smiled the same big, toothy smile back at me. I looked over at my mom’s big, toothy smile. It was a big, toothy smile-fest and it was perfect. I don’t have to cry every time I’m happy. Smiling is perfectly acceptable. “For real?” I asked. “Yup!” he replied. I took a deep breath and said, “Yes!” And that was it. I’m glad there wasn’t more fanfare in that moment. That was exactly what I needed after the over-the-top, emotional roller coaster I’ve been on for the past two years. Just a quiet moment in time that I could revel in and just be happy. And to add the cherry on top, I might be discharged from this latest stay in the hospital by tomorrow. Even if I’m not, Day 43 already has a heart by it in my calendar. Happy New Year! Bubble Girl out. Well it’s officially official. My bone marrow transplant, formerly known as my stem cell transplant, is a go. In exactly twelve days, I shall be “re-born”. I’m not trying to sound deep or all metaphoric. Scientifically and medically speaking, I will be a whole new person. Everything in my bones and in my DNA that says I’m Cristina will be gone. I am my father’s daughter but come November 16, I will be much more than that. It’s an overwhelming thought and come to think of it, it is metaphoric. In case you didn’t know yet, my father is going to be my bone marrow donor. After my only sister did not turn out to be a match, an extensive search by the national bone marrow registry turned up nothing. Not even one potential match. In a world where the average white person has 10-15 potential matches, this Hispanic had not a one. This hard reality sparked a new-found passion for me. If this is my reality, how many other Hispanics and minorities is this happening to? Apparently, too many are facing my same reality. A fire within me for this need to be filled began to grow inside me. As I voiced my concern to the media and the media began to validate my voice, my father was being tested as a potential half-match for my much needed transplant. This fire within me was about to have gasoline poured on it. As my biological father, it was a scientific inevitability that he would be a half-match. We all get half of our DNA from our fathers and the other half from our mothers. My father was preferred by doctors over my mother because he’s never had children and that’s a bigger plus for his immune system that he would be passing onto me. My mother didn’t hide her disdain at the fact that she would not be my hero but that my father would be the one to save my life. A beloved church family member one day told my mother, “Don’t be upset! You already had the privilege of giving life to this wonderful creature. Now her father gets to experience the same!” My mother gave in instantly to that thought and had to admit to the intense significance of the situation. I’ll admit, it struck me too. WARNING: If you are prone to crying while reading, please grab a tissue. Or two. This is about to get intense. My dad owes me. I’m not an ungrateful child. He has done everything and anything for me but despite all that, the man just plain owes me. Big time. In the summer of 2009, my parents, niece, and my husband and I, decided to take a weekend trip to a water park here in Texas a mere three hours away. A hint? It starts with ‘S’ and ends with ‘bahn’. My mother and my husband banded together in order to stay off the rides. They’re not big fans of bodies of water and slides that spit you out as they don’t know how to swim. They used my then 6 year old niece as an excuse to stay by the kiddie pools. My father and I, on the other hand, took the opportunity to partner up and get on every single ride the park had to offer. As the day began to come to an end and we prepared to leave, I asked my dad if we could get on one last ride. He of course said yes and we headed off, inner tube in tow, to the last ride of the day. It was supposed to be the most relaxing ride in the whole park but it turned out to be our worst nightmare. The self-propelled river took us on a tour of the park and the signs indicated that the ride ends in the actual natural river from which the park gets it’s water. I told my dad we needed to get off before the end of the ride because the river is deep and he can’t swim. I know you know where this is going. There was one last exit before the end of the ride and, you guessed it, we missed it. It wasn’t marked and it didn’t look like a very ‘official’ exit, so we kept going. I saw the end of the ride up ahead and my dad floating toward it in his tube ahead of me. We’d been separated a little ways back and I wasn’t able to remind him about the deep river at the end. I didn’t think twice about it and thought, “Oh, he’ll remember what I told him about the river being deep and he’ll just stay on his tube.” I couldn’t have been more wrong. I came off the ride in my tube backward not even a minute after my father. As my tube turned to face forward slowly, I began to scan the crowd that was walking up the exit stairs to the left out of the river. No Dad. Hmm. I scanned the people in their tubes floating out ahead of me. Still no Dad. HMMMM. And then I saw it. A lonely tube out in the water about 10 yards away. There was violent splashing a few feet away from it. The lifeguards at the exit of the ride were chatting away with each other, completely oblivious to what was going on right in front of them. “DADDY!! !,” I screamed at the top of my lungs as I jumped off my tube and swam furiously toward my drowning father. I swam up behind him, hooked my arms under his arms, and pulled him up enough out of the water so that he could finally breathe. He couldn’t say anything as he was coughing and gasping for air but his eyes said it all. He was happy to see me. The lifeguards finally swam up to us and helped my dad to the safe edge of the river. I was angry, scared, and grateful all at the same time. I’d almost lost my dad that day. After yelling at the lifeguards for not doing their job and fuming at the management, all I wanted to do was go home with my family intact and forget about the whole thing. My worst nightmare had almost come true and I wanted to get as far away from that place as possible. I buried it deep and put it out of my mind and even got angry anytime my mother would bring it up. And I did make myself forget about it. But my father never forgot. He would only tell me now and again how I’d saved him and how he owed me his life. I would brush it off and tell him that I only did what any child would do for their parent. He would never reply but the disagreement on his face told me different. I felt the air leave my lungs as I began to comprehend what he’d just said. He’d felt indebted to me for three years and I’d brushed it off like it was nothing. Now that my own life needed saving, I inherently understood how he felt about the day I’d saved his. As much as I had wanted to forget about that day, he hadn’t. Whenever my dad had talked about that day at the water park, he would say it was the day he’d been reborn from the water. His brush with death had made him value his life and blessings on a much, much deeper level. I could never fully understand the immense value he had placed on what I had done for him until my own face-off with death. I can now say that I understand the magnitude of saving a life and the preciosity of preserving it. And now, in an irony that I’m sure is not lost on you, his rebirth has made mine possible. Had I lost my father on that fateful day, my life now on this earth would most assuredly be coming to an end. While my mother is also a half-match, she would not be the best candidate for me as a donor. I came from her womb and so her cells would be the same ones doctors are now trying to change. And so, come November 16th, I too shall be reborn. My doctor tells me it will be my second birthday and should be celebrated with the same significance as my original birthday. My own bone marrow production, in which lies my DNA and immune system that has failed me, will be shut down by chemotherapy in the days leading up to the transplant. It will be replaced with two pints of my father’s healthy bone marrow, drawn out with surgery from his hip bones in his back that same day. He’ll be in pain for about a week while doctors keep a close eye on me in the hospital for about three weeks to make sure my body doesn’t reject his marrow. His immune system will slowly become my immune system. His blood type will be my new blood type. His DNA will be my full DNA, not just half. Future blood tests will show no more DNA traces of Cristina. But I get to live. My father’s debt will be cancelled out. I’ll always be me in my heart, mind, and spirit even though on paper, I’ll actually be my father. I’m my father’s daughter and now he’ll also be the biggest part of me. So one day, even when he’s long gone from this earth, he will still in essence live on through me. I couldn’t ask for more noble blood to be running through my veins. And who wouldn’t want a second birthday? The last two days have been great. Actually, they’ve been pretty perfect and today was just the culmination; the cherry on top. I’m floating high above the world on cloud nine and I don’t want to come down. My husband, German, and I left Corpus Christi for Houston on pins and needles on Tuesday night. We headed there with high hopes for good results from the scans that I was going to have on Wednesday. We arrived in Houston, checked into our hotel, and made our way out to dinner with a couple of good friends. We ate dinner, had some pie, and laughed with our buddies to keep our minds off the impending tests the next morning. Tuesday had ended successfully despite anything Wednesday had in store for us. Wednesday definitely had it in for us but it failed miserably in stealing our joy. We made our way to MD Anderson right on time for my first appointment at 9:30am for lab work in the Main Building. Fifteen minutes later, I was done. Since my next appointment for a CT scan was not for another hour and a half, I decided to take German on a tour of the MDA campus to kill some time. We stopped in the gift shop and I got an MD Anderson hoodie that I had been eyeing. We took the Skyway shuttle over to the other side in the Mays Clinic since I figured we would be back in time for my CT. Wrong. This is where Wednesday decided to try to get us. As we hung out by the Tree Sculpture in the Mays Clinic, I took a look at my schedule just to make sure what time we had to be back. I noticed that my schedule listed an address that was not the address of the Main Building. I walked over to the information desk and the volunteer informed me that that address was not the Main Building and that we would have to catch the patient shuttle to get there. “Oh and it looks like it gets here in three minutes downstairs,” he added. German and I looked at each other and without a word, we made a run for it. Unfortunately, we arrived downstairs just in time to see the back end of the shuttle leaving around the corner (insert ‘Saved By the Bell’ theme song here). We shrugged it off and sat down to wait for the next one that would come around again in about 20 minutes. It was after about 10 minutes waiting there that I realized that I no longer had the bag from the gift shop in my hand. I’d left my awesome new hoodie upstairs by the Tree Sculpture in the whole shuffle to get downstairs! Cue German running back upstairs to see if he could find it. He came back a few minutes later, bag in hand with my hoodie, safe and sound. Phew. The shuttle finally made it’s way back and we almost left the bag a second time on the bench we were waiting on. Forgetful much? We arrived 30 minutes late for my CT but we made it. Still, we were in a great mood. I drank my berry-flavored contrast, got my I.V. (not without it burning), and got my CT scan. Three hours later, we were leaving the clinic but not before I noticed German’s wallet on the seat where he had been sitting. Wow, Wednesday. Really? Nice try. Unphased, we hopped back on the shuttle and went back to the Main Building to get our car. We spent the rest of Wednesday at the Houston Zoo and went out on a dinner date complete with live music and great food. We went to bed completely exhausted yet content from spending the day together. Even though Wednesday had tried to sabotage our day, it was sadly unsuccessful. It was unsuccessful in stealing our joy because we’ve learned. We’ve learned not to worry about what tomorrow brings. We’ve learned not to sweat the small stuff. Worry doesn’t change anything but attitude can. Worrying is a ginormous waste of time and we had instead opted to spend that time enjoying the beautiful weather and each other. We went to bed fully expecting good results and nothing less. That’s exactly what God gave us. My first appointment this morning was with my stem cell doctor, Dr. S. His sunny face as he walked into the exam room left no doubt this time. I’d never seen him smile so big. This time was different. This time it was great news. He immediately let us know that the radiation had done it’s job. The mass in my chest was gone and he could now proceed with the stem cell transplant! Talk about the weight of the world off of our shoulders! God has begun to lead me out of my desert and back onto the road to my Promised Land, my Canaan. My second appointment with my lymphoma doctor after that was more of a continuing celebration rather than a follow-up. He came in with his assistant, both of them beaming from ear to ear. They’d never met my husband and after the introductions and required jokes about German being a figment of my imagination, all we did was rejoice and bask in the awesomeness of the news for the rest of the appointment. His assistant printed out copies of the before and after scans as a souvenir of sorts. 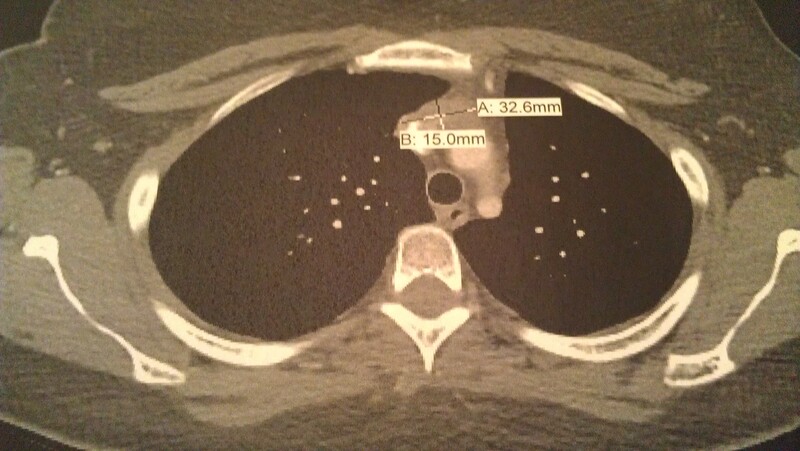 Before radiation: This CT scan view is as though you’re looking through the top of my head down into my chest. The mass is circled. After radiation: Yesterday’s scan shows the mass is almost completely gone and there is now an empty space where the largest part was. The ‘X’ marks what’s left of the mass. “I fully expect to see you back here in a few months in remission,” my doctor said as we were leaving. So do I. At this point, my father and I are expected back in Houston by Wednesday, Oct. 24th to begin preparations for the transplant. My father will undergo extensive testing and surgery to harvest the bone marrow I need. Since my father is a half-match, they need to use his bone marrow instead of just his stem cells to give me more of a chance for success. Meanwhile, I will undergo chemotherapy that will stop my own marrow production in order to replace it with my father’s. Dr. S. expects to have the transplant done within the next two weeks. I will be spending at least the next four months in Houston starting Wednesday. Thanksgiving, Christmas, and New Year’s will be spent there but I’m ok with that. What comes next is not going to be at all easy, but it’s a means to an end. After being on pause for almost two years for this, I’m on fast forward all of a sudden and it is WEIRD. German and I cried tears of joy and almost disbelief at our good fortune as we drove away today from MD Anderson. I will enjoy every minute of my last weekend back home with my husband, my family, my friends, and my dogs. I am back on the road to Canaan. I better pack my big suitcase this time. Now THAT’S a paradigm shift. Remember how I said in a previous blog entry that ‘I heart M.D. Anderson’? Well, I’m saying it again, this time with resounding emphasis and fervor: I heart M.D. Anderson! Why? There are various reasons but this past weekend really swept me off my feet. I am now officially head over heels in love with this place. This is serious, people. We’re talking true love here. What epic event caused this sudden influx of ‘that lovin’ feeling’? The M.D. Anderson Cancer Survivorship Conference. This two-day weekend event was exactly what the doctor ordered. It was food for my mind, my body, my soul, and my spirit. This conference was a major turning point in the way I view this whole situation. It caused a much-needed paradigm shift in my brain, an a-ha moment if you will. Oprah would be proud. I’d seen the pamphlets and posters around M.D. Anderson announcing this event for the past few weeks and it seemed interesting but I wasn’t sure it was something I should go to considering the word ‘survivorship’. Why is that, you ask? Because up until this weekend, I didn’t consider myself a survivor. You can see my problem with this definition and why I was having trouble applying it to myself. How was I to consider myself a survivor if I wasn’t in remission? I thought attending this “survivorship” conference would be rather weird considering I wasn’t a survivor. I got the push I needed to go when a good friend in the media department sent me an email suggesting that I attend along with all the information I needed to sign up. Talk about a push in the right direction. I rearranged all my medical appointments for that Friday and signed myself up along with my husband. We arrived bright and early the first day of the conference and walked up to the registration table to get our name cards and swag bag. “How long have you been a survivor?” the volunteer asked. This question perplexed me because I wasn’t in remission and I felt like an impostor. ‘Great, now they’re gonna know I don’t belong here.’ I must have looked very confused because then she asked me when I was diagnosed and proceeded to hand me a yellow lanyard for my name card. Apparently, yellow was for first year survivors. ‘Ok, if you say so,’ I thought to myself. Wrong again. As people began to share their experiences, I found myself nodding in agreement. I could relate to these people. The speaker then brought up the definition of a cancer survivor. Survivorship did not mean ‘remission’ and it did not diminish the battle of those that had passed on because of cancer. 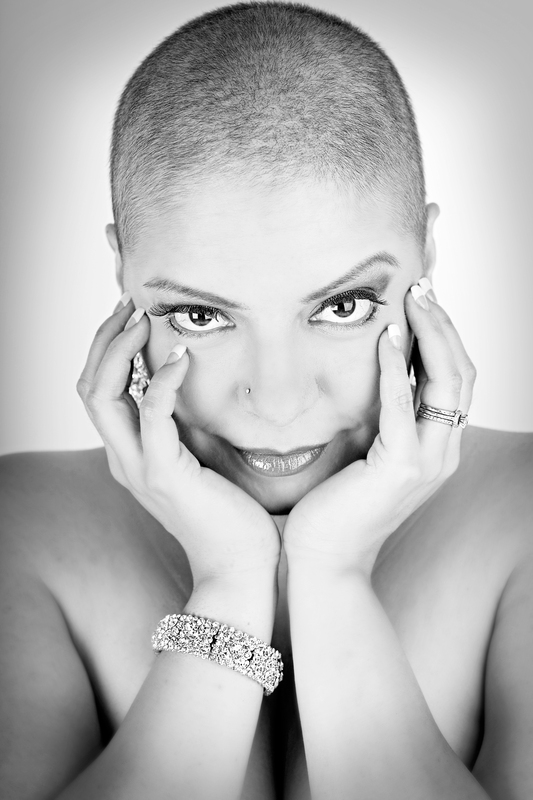 She said that the battle, the daily struggles against cancer, made us all survivors. Death is not a loss to cancer and it did not belittle the battle so bravely fought. It was at that moment that the light bulb turned on in my head. My a-ha moment had arrived. I began to cry as a lady talked about when she had realized just that because it was like she was inside my head, saying the very thing I was feeling in that moment. Over and over, people stated that they hadn’t felt like survivors until they realized that concept and I instantly felt complete knowing that I wasn’t alone. I wasn’t broken after all. I was only human. My love for M.D. Anderson grew that day with their definition of a cancer survivor. Even if I never hear the word ‘remission’ or even if cancer takes my life, I will always be a survivor. I will never forget all of the survivors that I had the privilege of meeting that fateful weekend, my new friends for life. The girl who’s fought brain cancer for 9 years straight and who continues to fight. The guy my age who’s ‘watching and waiting’ his prostate cancer. The twenty-something woman who beat brain cancer at the age of 9. The young woman who had her leg amputated due to bone cancer at the age of 13 and is now a nurse on the same floor at MDA. The talented violinist at our banquet dinner who was told she would not survive seven years ago. They are beating the odds and so am I, regardless of the outcome. The rest of the conference served as therapy for my husband and I from that point on. Compliments on my ‘do’ or newly resurfacing hair were abundant and very much welcomed. Our many new friends including a few that work at M.D. Anderson as volunteers and a whole group of young survivors just like me. My joy as my husband told me how he felt a huge weight off his shoulders just by meeting other husbands who have walked in his shoes. Our excitement as we got to meet and snag a photo with Dr. Ronald DePinho, the president of the cancer treatment center second-to-none other in the world. In the words of Ron Burgundy: that makes him kind of a big deal. And the best part? I know with absolute certainty that, no matter what, I AM A SURVIVOR. I HEART M.D. ANDERSON. Sigh…l’amour. Ok, so I’m not a poet but that’s pretty much how I feel about radiation right now. It’s a strange thing, this radiation. Today marked the 12th round out of 23 total rounds and I don’t know whether to love it or hate it. I’m not gonna lie. We had a rocky start, radiation and I. Our relationship is not great but it looks like we had a breakthrough today. Things are looking up for us. My first encounter with radiation was definitely NOT love at first sight. First impressions are everything and the first impression I got was a resounding (and I am not exaggerating): HELL TO THE NO! I literally came out of that first session in sobbing tears with my poor dad beside me in the car looking at me like he was a deer caught in headlights. My first appointment was only supposed to last about an hour with subsequent sessions to be half an hour long. I was fine until that first hour turned into two and then I was anything BUT fine. Let me make this clear before I explain what happened: I am not claustrophobic in the least. In fact, I kind of like enclosed spaces. They make me feel safe like a baby rolled up in a burrito blanket. But that first day, I got a taste of what claustrophobia feels like for the rest of the world. Each treatment usually goes the same way every time. 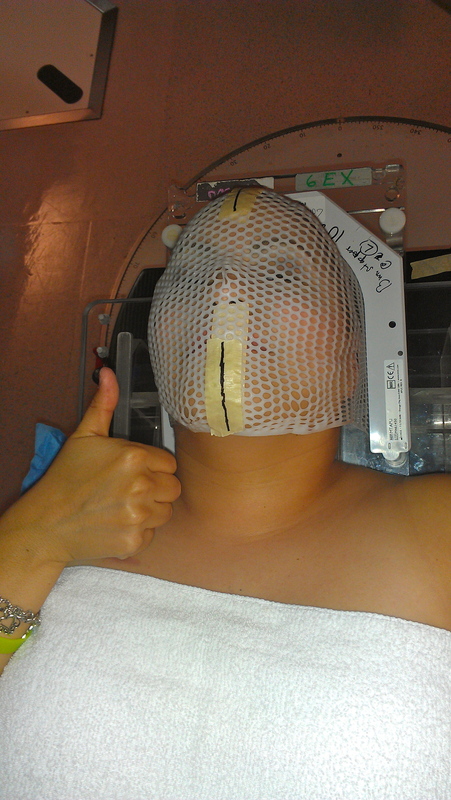 I have a special mask that was made to fit my face and head exactly for each treatment. This mask is made of plastic and has a honeycomb design that allows for me to breath, blink, and not much else. 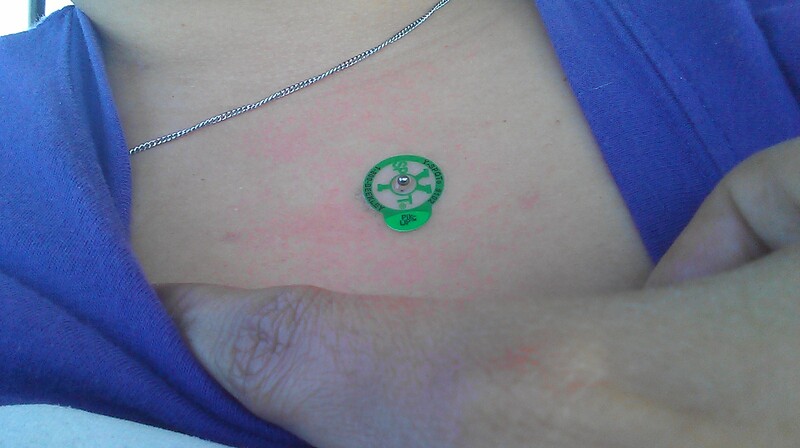 I lay down and they begin to mark my body with tape and stickers with little metal BB’s in them so they can aim the radiation machine just right. They put the mask on my face and snap it into place onto the table. I can’t move my head at all and can barely open my mouth to take a deep breath and hold it when they tell me to. The therapists tell me not to move and then leave the room because radiation is dangerous. Ha! The radiation machine moves all around me and a therapist’s voice comes on the intercom and tells me to hold my breath. I hold my breath until I feel like I’m going to pass out only to be told to do this over and over about ten times. The machine makes a beeeeeeeeping sound while I hold my breath to indicate that radiation is being emitted. I can’t feel it and it doesn’t hurt but knowing that it’s there is eerie. I think to myself every time as I hold my breath for ten years, ‘Don’t you dare move. You don’t want that crap going anywhere but through that tumor. Hold your breath, come on, just a little longer. You can do iiiiiiit…” Yeah, until I can’t anymore and I gasp for air so the machine has to stop. If my first session had gone this way, I would have counted myself lucky. But it didn’t. It was my first session so everything took a little longer of course. What nobody was counting on that day was for the camera that lines me up to stop working. By that time, the therapists had done a ton of prep work with my head strapped down on the table for the past hour. They couldn’t let me off the table until they fixed it or else I’d have to do it all over again and it would further push back my treatment. And so, I had to endure. During the next hour, my mind started racing and I started to spiral into the black hole my thoughts were pulling me into. Therapists kept coming in and apologizing and trying to reassure me that they would be done soon but it made no difference to me. The skin on my face hurt from the plastic mask pushing up against it. The back of my head was throbbing from being pulled so hard and for so long into the hard table. I began to repeat Psalms 23 over and over in my mind and praying to God to keep me calm and collected. It worked at first for about twenty minutes. Then it began. I started to feel the panic creeping in and tried to keep it at bay but to no avail. I wanted to move so bad but I couldn’t let myself for fear of having to do it all over again. I was incapacitated and panic became my master. I began to sweat when I had the absurd thought that I’d been forgotten and that nobody would ever come back to set me free from my mask prison. As my eyes began getting misty, I told myself to stop being a big baby. The tears inevitably started streaming down my face and rolled to the back of my head making it even more uncomfortable. The therapists knew I’d started crying because the machine noted my irregular breathing. They kept trying to reassure me over the intercom and I tried to stop crying but it was like a flood gate had been opened. Once open, they’re impossible to shut. After what seemed like an eternity, they were finally able to give me my first radiation treatment and let me off the table. They took the mask off first, of course, and helped me sit up. They wiped the sweat and tears off my bald head as I rubbed the back of my throbbing head and promised me it would never again take this long. I was doubtful about that in that moment and I just wanted to run away screaming in the opposite direction. I’d stopped crying when I re-joined my father in the waiting room but he could tell anyway that I’d had it rough. I thought I was ok until we got into my car and I looked in the mirror. My face had the odd honeycomb design from the mask etched into it and I began to sob. I was looking at the face of someone who had just totally lost it and panicked. I felt sorry for myself and proceeded to give in to my pity party of one. I don’t feel ashamed to say that I cried for a good 20 minutes straight. I’m an imperfect human and it was impossible not to. Now I know exactly what claustrophobia feels like. This was one of those experiences that you don’t ever wanna go through again, you want to completely forget it, and you don’t wish on anybody else no matter what. That was my first impression of radiation. Not good at all. Since that first time, I’ve had 11 more rounds and the therapists proved themselves: it has never again taken that long. 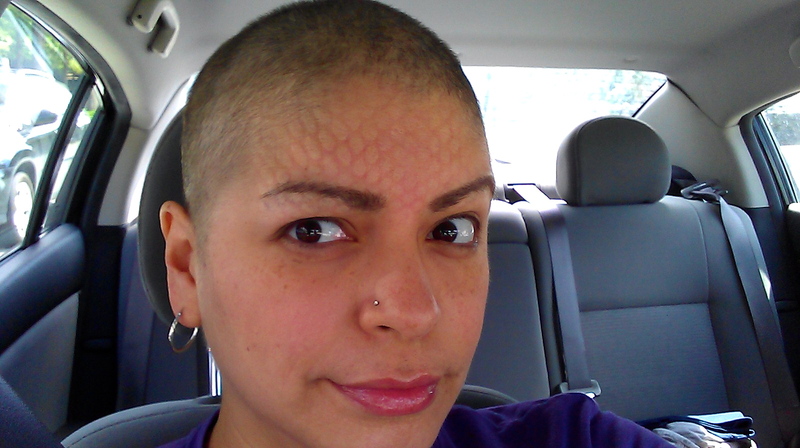 It’s actually been rather pleasant other than the honeycomb etching on my face afterward. My therapists are all so friendly and I’ve come to enjoy being able to see them on a daily basis. One of them even reminds me of Mr. Chow from ‘The Hangover’ and I can’t help but laugh to myself when he talks to me. Good thing he’s funny. And so, my relationship with radiation, although not perfect, has begun to improve. I was told by Dr. R today that I will probably start experiencing the effects of radiation by next week. I’m stand-offish toward radiation about that but at least we are starting to get along especially since Dr. R gave me the BEST news today that I’ve gotten since I can’t remember when: the tumor is SHRINKING!!! Yes, shrinking!! Jump for joy, scream and shout, clap my hands, and thank you Jesus! Oh, radiation! The rock in my shoe yet my Obi Wan-Kenobi. I hate that you are my only hope but you are WORKING! Now I must end this blog so that I can go dance a jig. A haiku and a jig all in one day for radiation. What is going on?! I feel like I’m being attacked left and right and I am. Literally. There is something dark at work here and it’s getting worse by the day. It’s a physical, emotional, and spiritual on-going battle and I’m surrounded. I’m cornered and I have nowhere to run. Nothing to do but stand my ground where I am. That’s all I have left: my stand and my faith that someone bigger is still watching over me no matter what. Oh God. My heart started beating so hard and fast I thought he could hear it. This is an x-ray of a set of normal lungs. These are not my lungs but it’s the best representation I could find on Google. The dark parts indicate air so those are the lungs and the lines at the bottom drawn in are the diaphragm. Now, a short medical lesson: the diaphragm is the skeletal muscle that separates your chest from your intestines and contracts up and down to allow the lungs to take in and expel air. Although not a very often thought of part of the body, it is a very important one. If your diaphragm isn’t working, you ain’t breathing. This brings me to the most important part of that conversation. 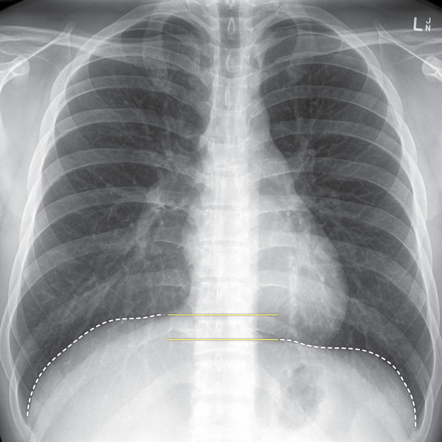 Again, this is not the actual x-ray of my chest but it might as well be. Isn’t that gnarly? “Why is my right lung way up there? !” I asked him. 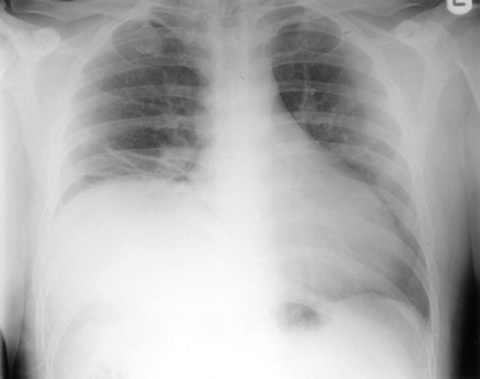 Diagnosis: diaphragmatic paralysis. The tumor in my chest is squeezing the nerve that controls the right side of the diaphragm causing it to become paralyzed. My right lung is no longer contracting as it needs to so it’s only working at 60% capacity. Bells started going off in my head and a lot of questions were automatically being answered in there too. The time after chemo when I was panting like a dog in my bedroom and all the times since then. Being out of breath walking across the house. Gasping for air at band practice when I tried to sing. This whole time I’d blamed the chemo for making me tired, therefore, out of breath. In reality, it was the tumor that had been causing all my problems. Dr. C asked me if I’d been feeling out of breath and I told him everything. He nodded in agreement of the symptoms I was naming off for him, one by one. According to my symptoms and since my April scan was normal, it’s been since June more or less that my diaphragm became uncooperative. So what does all this mean? We don’t know yet. Dr. C says that even if the radiation works to shrink the tumor, the nerve only has a 50/50 chance of returning to normal. He said we’ll have to wait and see, but in the meantime I have to condition my lungs and body with moderate exercise to work with 60% capacity just in case it stays this way. Although Dr. C says this is do-able, that I can live with 60%, it’s still gonna be a huge challenge. The things I love to do the most right now are most in jeopardy. I thought about dancing, my number two love. I dance like nobody is watching when everyone is watching. I sweat like a pig until I’m out of breath just to keep going. A 60% working lung doesn’t lend itself to that. How is my husband gonna spin me around on the dance floor without me looking like my eyeballs are gonna pop out from losing oxygen? Not a pretty picture. 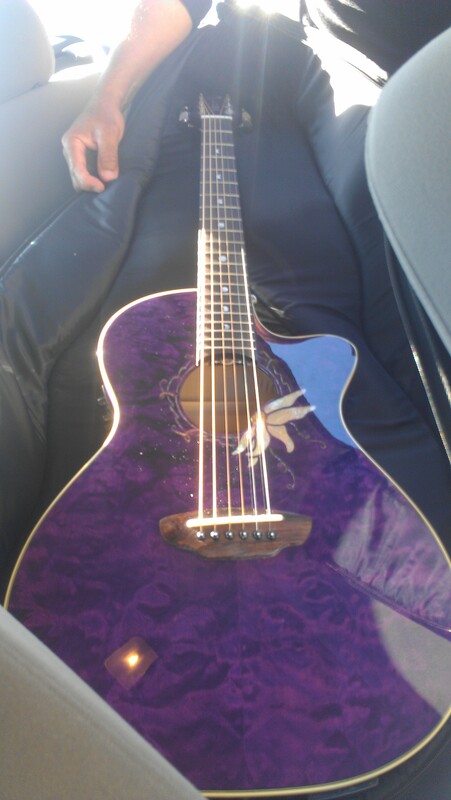 And my number one love? Singing. It hasn’t been impossible to sing, but it’s definitely been a challenge lately. And that scares the living crap out of me. I haven’t been able to dance in over a year because of my bum hip anyway and I can deal with that. Not being able to sing? I can’t deal with that. It’s been the only thing that I can still do through all this; the only thing cancer has not taken from me. Even though it’s being challenged, I am determined to not let this tumor take away the one thing I can still do well, the one thing I have left: my voice. Before you close the door, I need you to hear me sing. I have to. There’s nothing I’m as good at or as passionate about or that brings me that much joy. Through this whole journey I’ve repeated to my husband time and again, “As long as I still have my voice and I can sing, I don’t care if I can’t dance.” Ironically, now that statement is being challenged. The ability to still be able to sing despite my situation means everything to me. It means I’m still me in spite of it all. So help me God, I intend to keep it that way. Don’t wanna be your monkey wrench. A lot can happen over three days. Three days, that’s all it took. I’ve been here in Houston for those three days and it’s been a whirlwind of news, change, and emotions. I knew it was going to be a bit overwhelming but it’s turned out to be more of a game-changer than anything. I could never have predicted what has transpired over the last 72 hours. When I left my hometown of Corpus Christi three days ago, I was a month out of my tenth round of intense chemotherapy. I was heading back to MD Anderson in Houston to see if I was in remission yet to be able to receive my stem cell transplant. My one and only sibling, my little sister Carolina, had been tested to see if she was my perfect match for the transplant. I’d been told that she is not my match and they would have to begin the search for a donor through the national bone marrow registry. I received the call on a Friday while I was driving and I barely made it home. I was crying so hard I had to hang on to the back of my dining room chair to try to catch my breath and to keep from crumpling to the floor. Both my sister and I had been so hopeful that she’d be my match, I couldn’t bring myself to tell her the news myself. My husband had to call her and give her the news through tears and heartbreak. The three of us were heartbroken yet again. Despite the setback, I set off for Houston with my parents this time with positivity and no tears. I didn’t cry when I told my friends and family goodbye, when I hugged my dogs, or even when I waved to my husband as I slowly backed my car out of the driveway. I left in complete peace, in stark distinction to the last time I’d left for Houston. Upon arrival, Monday was more of a ho-hum day at MD Anderson what with the usual tests done to check if I was in remission. I spent all day there with blood work first thing at eight in the morning, then a PET scan, and finally a CT scan. My parents and I left the hospital at 5pm tired and hungry yet hopeful for good news the next day. I should have just stayed in bed on Tuesday morning. Our first stop was with my lymphoma doctor for the much anticipated results. I’ll call him Dr. L for lymphoma. And for privacy reasons, duh. Dr. L walked into the exam room and got right to the point. Bad news: I was not in remission. He explained that although the tumor in my chest was still there, it hadn’t grown. It hadn’t shrunk either. That was monkey wrench #1. Monkey wrench #2? 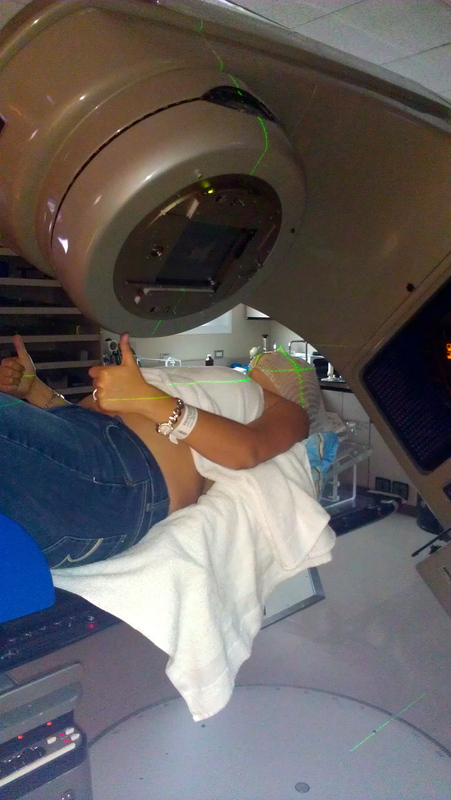 : I now needed radiation and lots of it. They were changing treatment since the cancer hadn’t responded to chemotherapy. I’d been hoping I would be done with all this cancer junk at least by Christmas this year but with 4 weeks of radiation being thrown in before the transplant, that was no longer going to happen. This monkey wrench is gonna have me spending my Christmas in a hospital room this year. I now have a 3rd doctor to add to my roster at MD Anderson: my radiation doctor. Let’s call her Dr. R for radiation. I think you’re getting the picture now with the doctor aliases. I was sent down to see her immediately after my visit with Dr. L. She’s very beautiful and very pregnant. I instantly liked her. Although I’m not looking forward to radiation in the least, I’m happy to have her as my doctor for this very scary part of my treatment. She greeted my parents and I warmly and she calmly explained everything that was about to happen to me over the next few weeks. They would work to shrink the tumor with radiation in order for me to have my stem cell transplant. Dr. R showed me the pictures from the PET scan the day before and I was able to view the tumor in my chest for the first time ever. It was eye-opening to say the least. 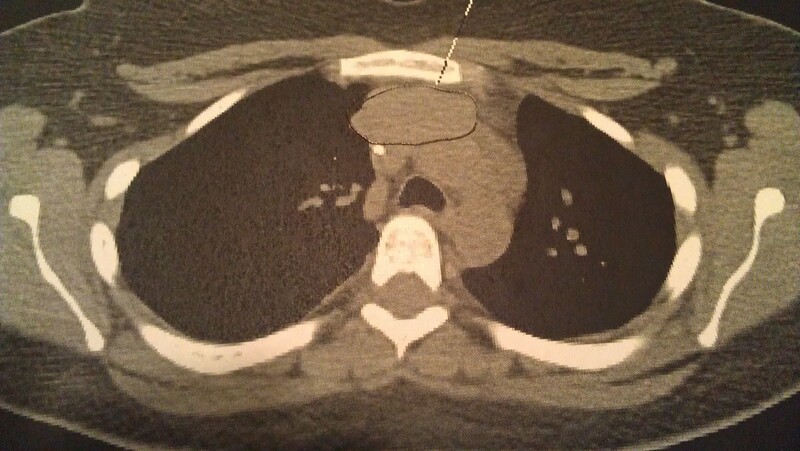 I had been pointing to the wrong spot on my chest this whole time when people asked me where the tumor was. What a colossal dummy. Dr. R went down the list of the possible short-term and long-term effects and described everything down to the last detail. Skin redness and increased risk of heart problems and breast cancer are just a few of the lovelier side effects. She let me know that I’ll be having radiation there with her for the next 4-5 weeks, Monday through Friday, and that I’ll be able to go home on the weekends. That sounded like a good thing in the grand scheme of it all. But wait, here comes the REALLY good part. I predict you will say to yourself, “WHAT? !” Then, I will say I told you so in just a little bit. Go on, keep reading. I left MD Anderson with my parents feeling good despite the news I’d just received because I felt like all my questions and concerns had been addressed. I knew what to expect. I left in anticipation on my way to a local Houston television news station for an interview. I’d been contacted by them a couple of weeks before my visit that they’d picked up my story and wanted to help me in my new passion of promoting awareness among Hispanics about the importance of registering on the national bone marrow registry. They were excited and so was I.
I arrived at the station and as I sat in my car powdering my nose and touching up my non-existent eyebrows, my cell phone rang. Here comes monkey wrench #3. I should have known something was up when I saw it was from MD Anderson. I didn’t think anything of it as they were supposed to call me that afternoon about my future radiation appointments. Wrong. It was Dr. L’s physician’s assistant. “Cristina?” (Because I’m now on a first name basis with everyone at MDA.) “Yeah bud, what’s up?” I asked. “Um, are you still here at MDA?” This was getting weird fast. “No, I’m at a news station for an interview. Why?” I replied. “We looked at your CT again from yesterday,” UH OH, “and we found a blood clot in your lung.” Say what?! I told you so. Wait it gets better. “How long do you think you’ll be at your interview because we need you to come back to MDA for medication. Do you know how to self-inject?” WHAT?! Heck no, I don’t know how to self-inject! He proceeded to tell me that I would have to self-inject a blood thinner every day for the next SIX months. I could not believe my ears. My mouth dropped open and a fly could have made his home in there without me noticing. “Wait a minute. Friend, did you just say SIX months? You’re joking right?” I pleaded. “I’m sorry but yes it’s for six months,” he replied. Here I was nervous already for my impending interview in the next 30 minutes and another bomb had been dropped right on my head. I didn’t have time to process it. I had to gather my thoughts and get my head together for this interview. I had to put on my big girl pants. The bone marrow registry needed my attention more at that moment than my own health problems. I think God planned it perfectly this way. It made me see that there is always something bigger and more important than myself. I had to be the best that I could be in that moment and be able to articulate the message I so needed Houston’s Hispanic community to hear. I walked into the news studio, took my hat off, and proceeded to do the interview cue-ball bald. I felt liberated and the words flowed as if God was right there in my ear, whispering them to me. Before I knew it, it was over and I quickly said my thank-you’s and goodbye’s. I had to get back to my own reality, after all. With my medication in hand, Tuesday was finally over. Little did I know what Wednesday would bring. Wednesday. Today. Today had another monkey wrench in store for me. What number were we on? Oh yeah, number 4. I had an appointment today with my stem cell transplant doctor, Dr. S (S for stem cell, you got it). At this point, we all knew my sister was not a match but here comes the clincher: Dr. S said that they had done a search on the national bone marrow registry but no match was found for me. Wow, another punch in the stomach. He explained that my genetic make-up is very ‘unique’ and it’s going to be difficult to find a match. I mean, I always knew I was weird but now it was being genetically confirmed. Dr. S turned to my parents and informed them that if a match was not found by the time I needed it, we would have to settle for a half-match, i.e. one of my parents. If it turns out this way, one of my parents will have to give me bone marrow instead of stem cells–a more involved process. By the time we all knew it, we’d been sent down to the lab for both of my parents to have their blood drawn for HLA typing. Results won’t come in for at least another seven business days so we’re bracing ourselves for a long week. Three days was all it took. Three days for a total game-changer but I’m putting on my game-face. Game on. For more information on becoming a bone marrow or stem cell donor, visit www.bethematch.org. Be a hero. Save a life. Be the match.